A few years ago I purchased on eBay a remarkable topiary form in the shape of a smooth fox terrier. It is the creation of a very talented guy, John Hoskins and he lives in San Diego, CA. 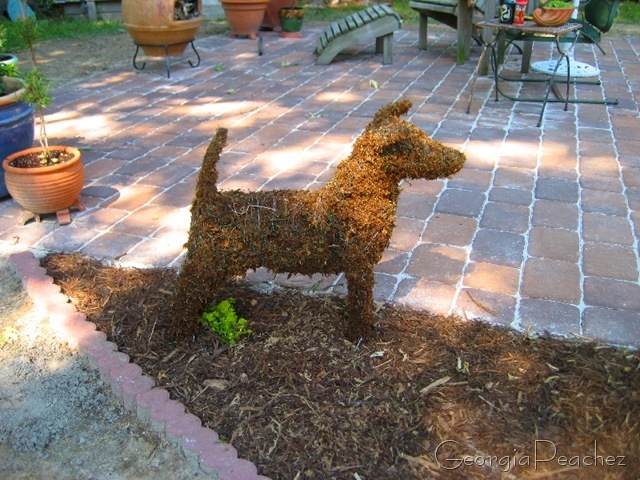 John creates these forms from a very sturdy chicken wire and shapes them in to every breed of dog imaginable. Check out his website and you can see pictures of all the different breeds done up in wire. So finally this weekend I got out all the sphagnum moss that I have been collecting. I find that stuff at the thrift store all the time and it's a good thing because it took 4.5 bags to stuff my little doggie. But it looks great. I have her planted next to my new patio and I put a little creeping jenny down by her rear paws. The creeping jenny will be trained up onto the topiary form so I will be sure to post more pictures later this summer as it progresses. Now go have some fun in your garden this weekend. this is so dang cute. i need the beagle one. so fab. That is SO COOL Suzy! Absolutely no point in staying indoors to blog when the weather is perfect. Why waste our lives on a computer where there is “stuff” to do; life to live… gardening, golf, motorcycling, just hanging around on a lovely patio sipping wine and watching little birdies splashing in the bath….taking pics of our beautiful flowers and plants..
Blog when it rains… hahahhahha……. I am having some rainy ones at the moment…. Am I imagining things or did you just change your blog banner? Menopause, you know. Or perhaps you don’t yet. But you (I)easily get confused. Or is it “get” easily confused? wow! I love those..I made a teacup and teapot out of wire..I love them.